Music for three violins and bass formed a small yet distinctive corpus of instrumental music at the Restoration court of Charles II and in the Catholic chapel of James II. 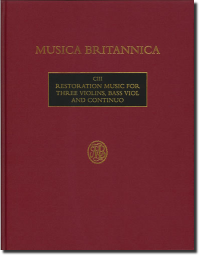 Introduced to England by the German violinist Thomas Baltzar, the genre was adopted by John Jenkins, whose ten late fantasia-suites for three violins, bass viol and continuo, together with Gottfried Finger’s five sonatas for the same group of instruments, constitute the bulk of this volume. Other representative works include Baltzar’s own Suite in C major and Bartholomew Isaack’s Ground in A minor, all fascinating progenitors of Purcell’s crowning contributions to the repertoire, his Pavan in G minor and ‘Three Parts upon a Ground’.